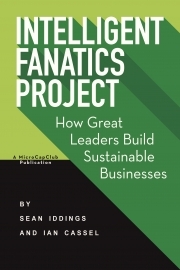 Description of "Intelligent Fanatics Project"
How does a great company sustain and grow profits for decades? Many people are familiar with Warren Buffett’s analogy of a moat: various defenses to thwart competition. But moats are fleeting; they are here today and gone tomorrow. The more important question is, who builds and maintains moats? Intelligent fanatics do. These leaders build high-performance organizations that can dominate for decades. Intelligent Fanatics Project looks at the stories of eight intelligent fanatics who built dominant and enduring businesses. A $1,000 investment with each of these intelligent fanatics would, on average, have been worth $3.4 million thirty-seven years later—a 24.6% compounded annual return. They operated in a wide array of industries, in different time periods, on different continents, and against different economic backdrops, yet their leadership styles, strategies, corporate cultures, and values were similar. Intelligent fanatics are what every entrepreneur aspires to be and what every long-term investor dreams of finding and investing in early. Sean Iddings and Ian Cassel examine the common traits of these intelligent fanatics, to help both the investor and the entrepreneur generate extraordinary returns. Sean is the founder of Unconventional Capital Wisdom, a registered investment advisor in New York State seeking to invest in high quality microcap companies led by intelligent fanatics. He is a member of MicroCapClub and writes about investments, entrepreneurship, and leadership on a number of blogs and publications. His first book series, Intelligent Fanatics Project, is the culmination of years of experience, intense study and collaboration on the common patterns between some of the most successful companies and leaders of the 19th and 20th century. His goal is to help both investors and entrepreneurs generate extraordinary long-term returns and positively impact the world. Sean is also a long distance runner having completed five marathons across the globe and a jazz/rock guitarist. He lives outside Ithaca, NY with his wife Samantha and is expecting a daughter later 2016. Ian is a full-time microcap investor and founder of MicroCapClub. Ian started investing as a teenager and learned from losing his money over and over again. Today he is a full-time private investor that supports himself and his family by investing in microcaps. Microcap companies are the smallest public companies that exist, representing 48% of all public companies in North America. Berkshire Hathaway, Wal-Mart, Amgen, Netflix, and many others started as small microcap companies. Ian’s belief is the key to outsized returns is finding great companies early because all great companies started as small companies. MicroCapClub is an exclusive forum for experienced microcap investors focused on microcap companies (sub $300m market cap) trading on United States, Canadian, and UK markets. MicroCapClub was created to be a platform for experienced microcap investors to share and discuss stock ideas. MicroCapClub’s mission is to foster the highest quality microcap investor community, produce educational content for investors, and promote better leadership in the microcap arena. Ian received his B.A in economics from Millersville University and earned an MBA from Villanova University. Reviews of "Intelligent Fanatics Project"